Last weekend, as expected, Virginia Tech Wrestling destroyed Duke in a road dual meet, 40-3. It was the Hokies’ eighth dual meet win in a row, and it moved Virginia Tech from No. 12 in the nation to No. 11, per InterMat’s Dual Meet Rankings. Provided the Hokies can take care of business on the road at UNC this Friday, Feb. 8 (more on that in a moment), things continue to build to a meeting with NC State in Cassell Coliseum on February 22 that will likely decide the ACC dual meet championship. And here’s another reminder: TechSideline.com invites you to attend that Friday night wrestling match vs. NC State, in an attempt to break the Hokies’ home attendance record of 5,097, set during a meet with Penn State in November of 2015. Wrestling is free, and you know where Cassell Coliseum is. Per the rankings and records, North Carolina is the third-best of the ACC’s six wrestling programs. Last weekend, the Heels edged out Pittsburgh 19-16 to knock the Panthers down a peg. This week, Virginia Tech wrestling gets a chance to do the same to UNC. Here’s a look at the projected individual matchups, with rankings (top 20 only, in bold) via Intermat. 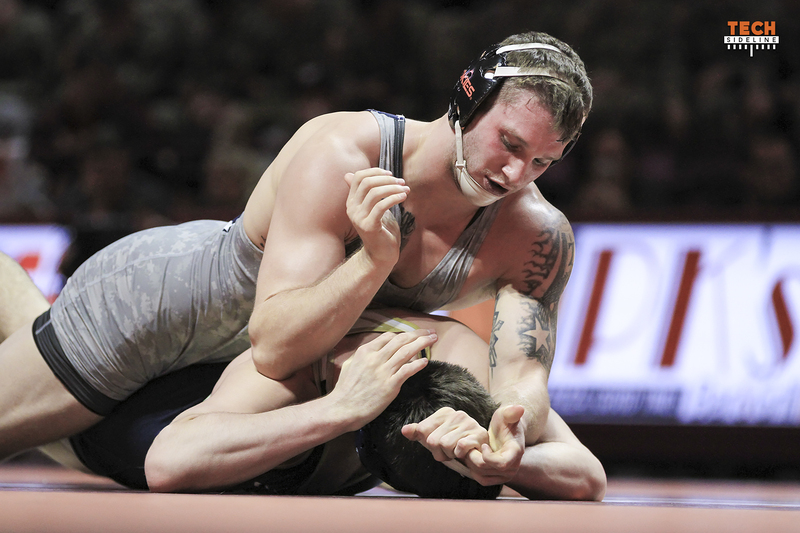 The Hokies have a pronounced edge in the upper weight classes. The dual meet predictor at WrestleStat.com predicts a 25-7 Virginia Tech victory, with VT winning at 125, 133, 141, 165, 174, 184, 197 and Heavyweight. WrestleStat projects UNC to win at only the 149 and 157 classes. How does wrestling dual meet scheduling work? I’m seeing NCSU with six more matches than VT at this time, which seems to be a big difference. You schedule your in conference duals. For the ACC that is 5 dual matches required. Beyond that, a team is free to schedule whatever they want out side of that for the most part. NC State scheduled more OOC duals this year and only one tourney – NC State Open. VT scheduled less duals and more (three) tournaments. 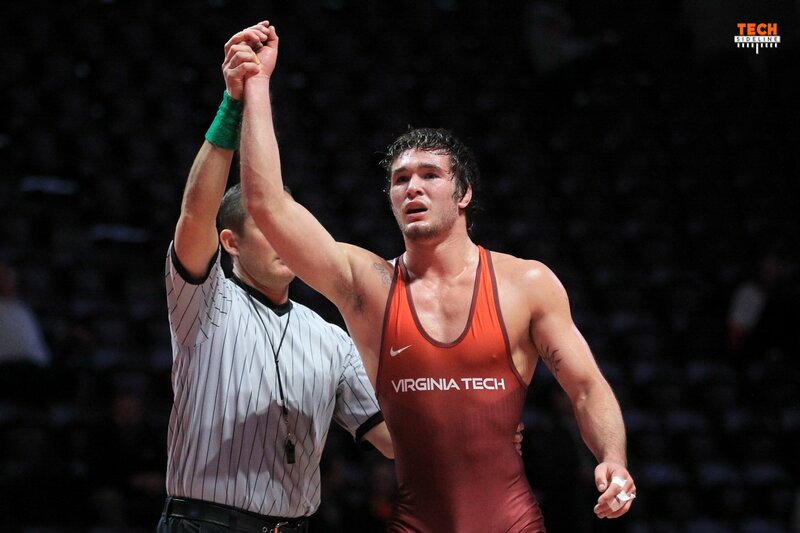 VT wrestled in Hokie Open (similar to NC State’s Open); Cliff Keen; and Southern Scuffle. A wrestler can get anywhere from 2 to 5+ matches in a tournament. It is more about getting the wrestlers quality matches than racking up dual wins. In the end our wrestlers will have approximately the same number of matches as NC State (just not duals). Cliff Keen and Southern Scuffle are hard and challenging tournaments — Robie probably feels these tournaments better prepare the Grapplers for the end of season tournament style ACC and NCAA Championships. And based on history, it has worked. I will add that a dual match may only give a strong team a couple of quality match ups at certain weight classes. It did the team no good beating Duke 40-3 — there were only a couple of worthwhile matches. In a tournament setting, EVERY wrestler will be tested a couple of times with high ranked matchups. Tournaments are way better for improving the wrestlers IMHO. Always take in the home matches. Plus the ACC Tourney is at VT this year. VT has hosted this before. The ACC Tourney at VT is a good time. Let’s pack the house for that one!